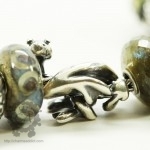 Many long time Trollies will automatically recognize Kathy Perras as one of the preeminent artisans to have collaborated with Trollbeads; Kathy created their incomparable Siberian Tiger bead released in 2003 and retired shortly thereafter. 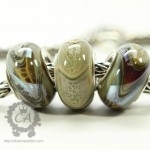 Later, Lise Aagaard produced a similar Tiger bead as well in 2005 which retired in 2006. 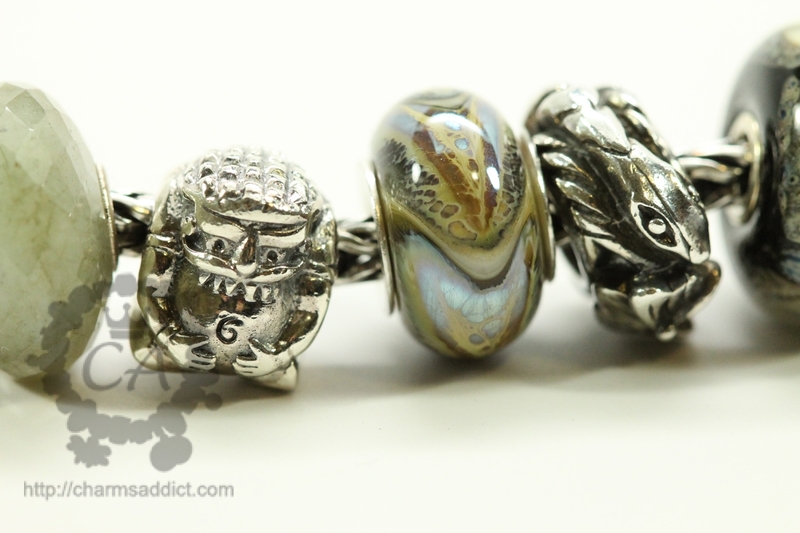 These short release windows combined with the size of the much smaller Trollbeads market at the time has created an insatiable demand for these beads. 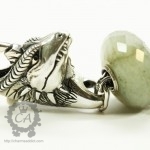 Kathy began to make reproduction Siberian Tiger charms at her independent studio in Portland, OR around 2011, and unsurprisingly they have been a huge hit! Recently, I had the honor of interviewing Kathy regarding her process and inspiration, and I’m very excited to be unveiling an exclusive first look at her newest design. Q.) How did you get started in glasswork? Thirty years ago I took classes in creating stained glass lampshades and windows. I created a variety of windows and shades of my own designs and sold them for several years. I was attracted to kiln-formed glass and purchased a kiln to create small items for jewelry. I knew that I loved working with glass and the possibilities were endless. We took a trip to Sante Fe, New Mexico in 1994, and during an unexpected snowstorm, we ducked into the convention center that was hosting a “Bead Expo”. It turned out to be a pivotal event in my life. 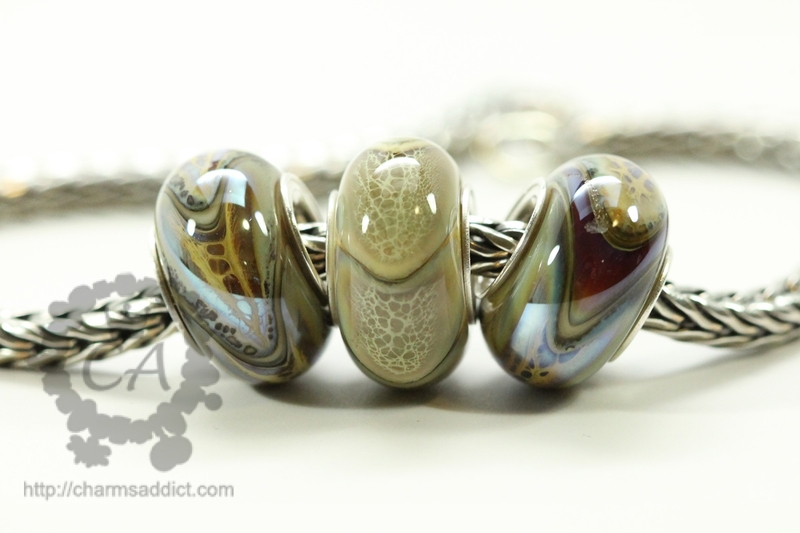 I met some of the glass and bead artists that inspired me to become a bead maker there. I bought the torches and equipment before I left New Mexico, and when I arrived home I taught myself how to make beads over the torch since there was no one in Toledo to teach me the craft. I learned that it definitely is “not as easy as it looks”. Q.) What is your inspiration for your designs? At first I just wanted to learn every possible technique I could find. My first few years were spent learning sculptural techniques. Later, my work took on a very organic tone and my muse keeps bringing me back that point with nature and earthy themes. 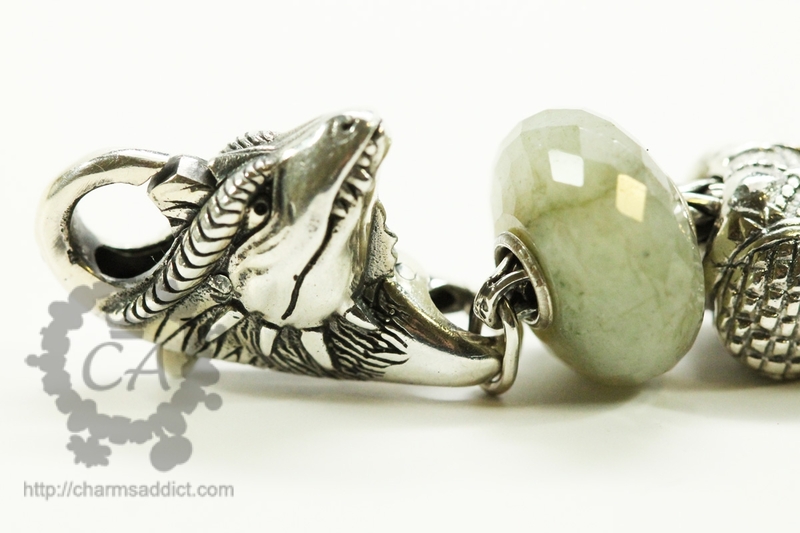 I particularly like creating interpretations of lapidary stones and animals. I started making my original tiger designs in 1998, and have been making them steadily since then. Q.) 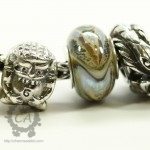 How was working with Trollbeads? I met Lise Aagaard at an ISGB bead conference in 2002. We had dinner together and talked a great deal about our beads. She asked me to make the tigers for her company in Denmark and I was rather surprised by the fact that she wanted them so small and with such big holes — so funny! 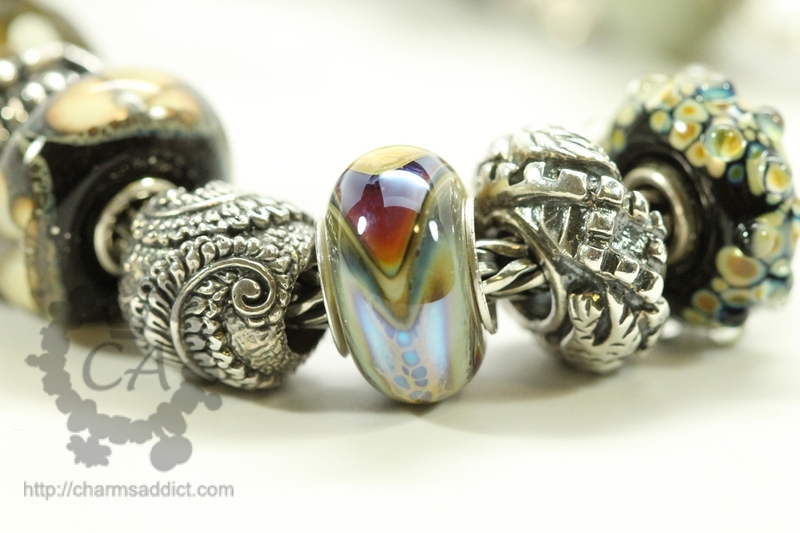 I had never heard of Trollbeads and until years later; I never really knew much about what happened to the beads except that she used them for bracelets. I truly liked Lise Aagaard and enjoyed working with her. She was generous to a fault and a wonderfully genuine person, and I would love to work with her again. 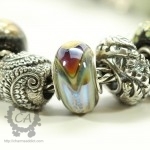 I had the opportunity to go on a demo tour with Trollbeads USA in 2011 and it was a great experience. 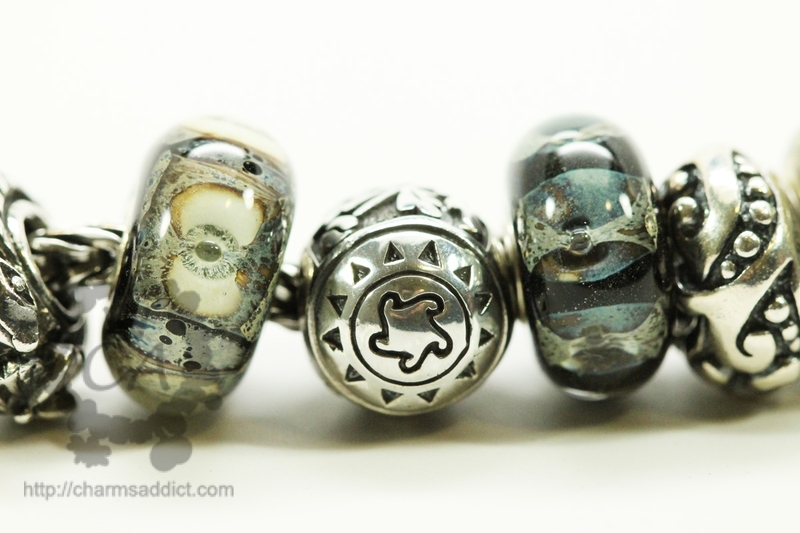 I met a lot of TB collectors, enthusiasts and TB distributors there; until then I don’t think I fully understood what Trollbeads meant to people. Q.) 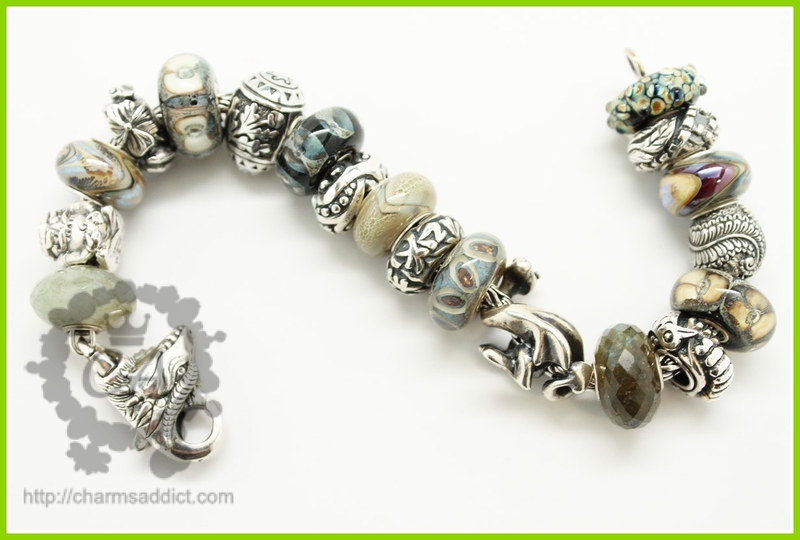 How long have you been making lamp work beads? I have been making beads since 1994. It became my profession in 1998. Q.) What do you enjoy most about being a glass artist? Working at the torch is the closest thing to a meditative state that I have ever found. I lose all track of time and find myself living in the moment. You have to stay focused and open to what the glass wants to do and work with it, not against it. When I was a glassblower we used to call it “The Glass Dance.” Sadly I’m getting too old to do the “Glass Dance” at the glory hole but the torch is very forgiving! I never get tired of it. Q.) What other hobbies or passions do you have? I guess I’d say that I’m a cinephile and a bibliophile. My husband and I watch lots of movies and I read various genres of books all the time. I also love to cook… not bake but cook. I never was very good at baking. And of course, I love to eat good food so that has worked out well living in Portland. It has the most wonderful restaurants, cafes and food carts! Q.) Is there anything else you want the readers to know? I think people might be surprised how much I have really loved making beads for the TB enthusiasts around the world. I have never met a friendlier and more generous group of people. I now have friends that I have met through these connections who have inspired my designs, helped me to grow as an artist, and become very important people in my life. Their passion has become my passion and I’m grateful to each and every one of them. Bead making can be a very solitary pursuit but now I can enjoy the connections I have made with all my TB friends. It’s a good place to be. Kathy has a number of patterns based off animal prints which have made a staggering comeback. Her newest addition to the Kathy Perras line, are the Snakeskin Dillos. 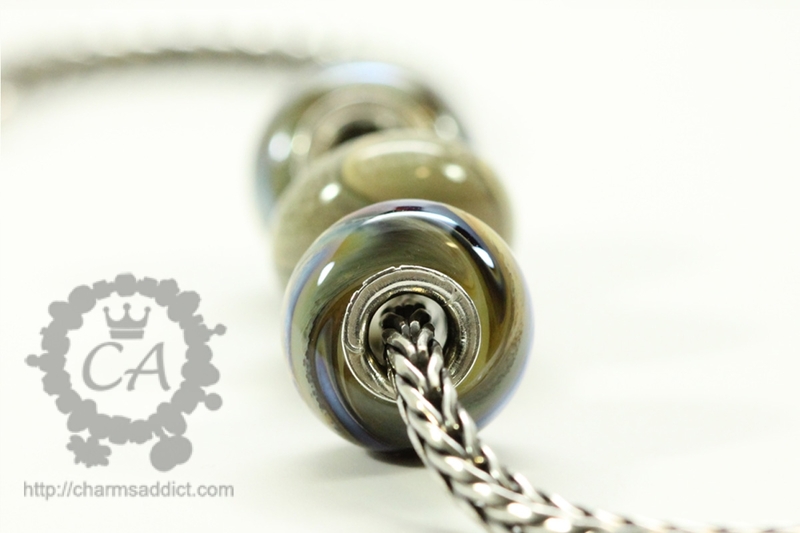 When she told me about them, I was intrigued and when I saw them in person I was delighted by the metallic luminosity of these beads! 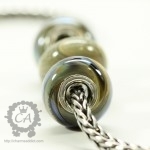 As I’ve mentioned in the past, dillos are one of my all-time favorite designs and the intricate and elaborate snakeskin detailing on these beads is out of this world. I received* 3 versions of this pattern and they’re each absolutely gorgeous. 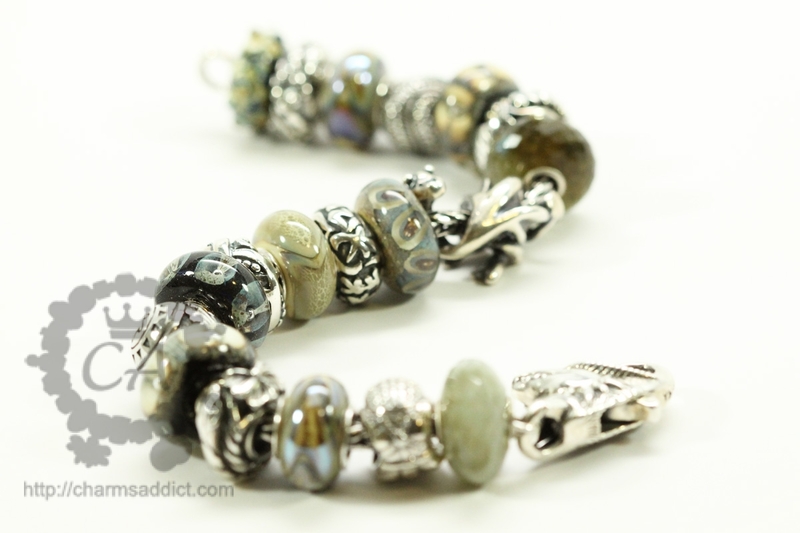 The colors are organic and complements the new Rocky Beach Kit perfectly, as do the Labradorite gemstones to name a few. 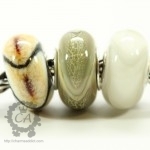 These are small cored, which means that they only fit on Trollbeads or non-threaded bracelets. 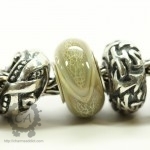 The Snakeskin Dillos are listed on PerrasBeads Etsy shop but quantities are limited. There are also a number of other designs that Kathy has created which will be featured in upcoming articles and you can peruse on Kathy’s website here. Some of her beads are highly sought after and require a bit of waiting, but they are well worth it and she can be contacted through her Etsy shop. I hope you’ve enjoyed a peek into the creative process of a renowned designer, and a big thank you to Kathy for taking the time out of her busy schedule to chat with me! What do you think of these amazing designs? Bead index (starting from left): redbalifrog dragon lock, labradorite, redbalifrog thai troll, PerrasBeads snakeskin dillo, LE China white snake (retired), sandbeach, redbalifrog Russian egg, cliffs, jugend, PerrasBeads snakeskin dillo, WT Hong Kong auspicious, sandstone, lucky dragon, labradorite, LE China silkworm (retired), stone flower, redbalifrog fern leaf, PerrasBeads snakeskin dillo, LE China great wall (retired), milan. *For more information please see our Disclosure Policy. Thanks Leann, interesting article and great to hear about the designer, I like to hear about the process and the story of the person who does the creating! I’m so glad you like it, Martine! The beads are even better in person. LOL, I’ll keep that in mind ;). I love being to make so many different looks with these beads. 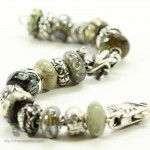 Leann, I am so glad that you found your way to one of my favorite artisans and very dear friend! Kathy is so very talented and her beads are all so special and unique! 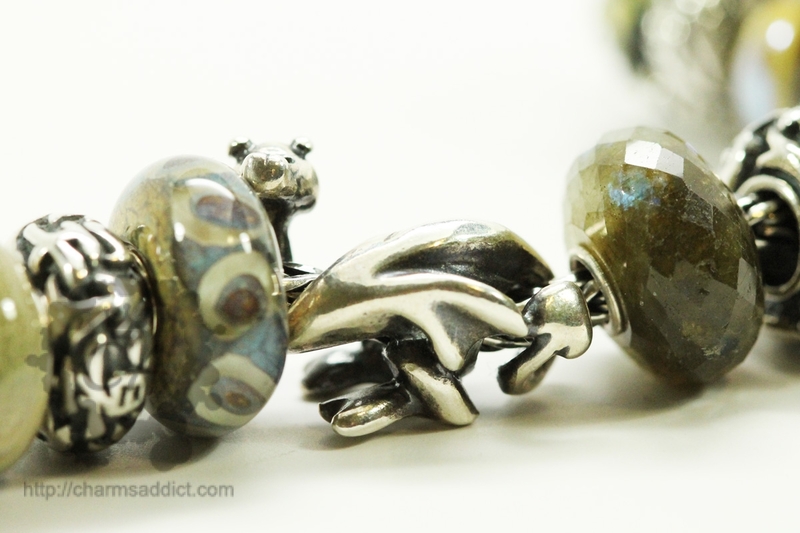 Her Siberian Tiger beads have remained an Icon of Trollbeads history, even though it was retired from the Trollbeads line some time ago. 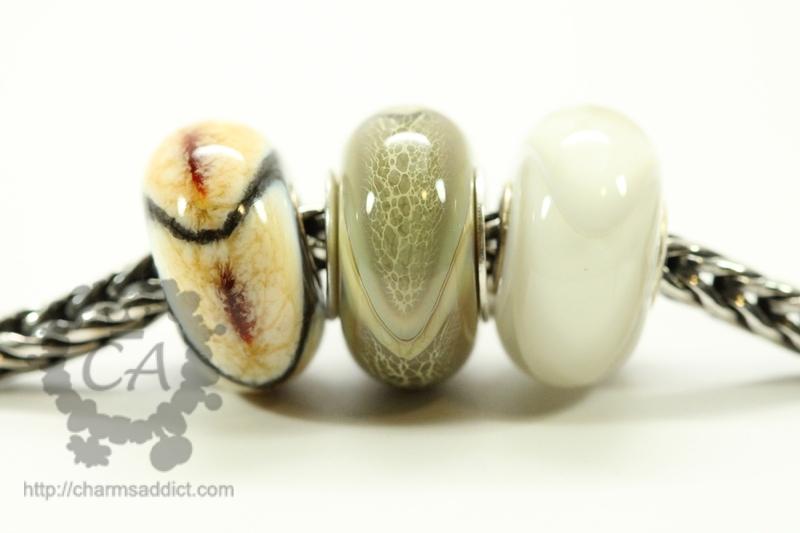 I have a wonderful collection of Kathy’s beads and am so excited about her new snakeskin dillos! I think that they are fabulous as are all of her beads. 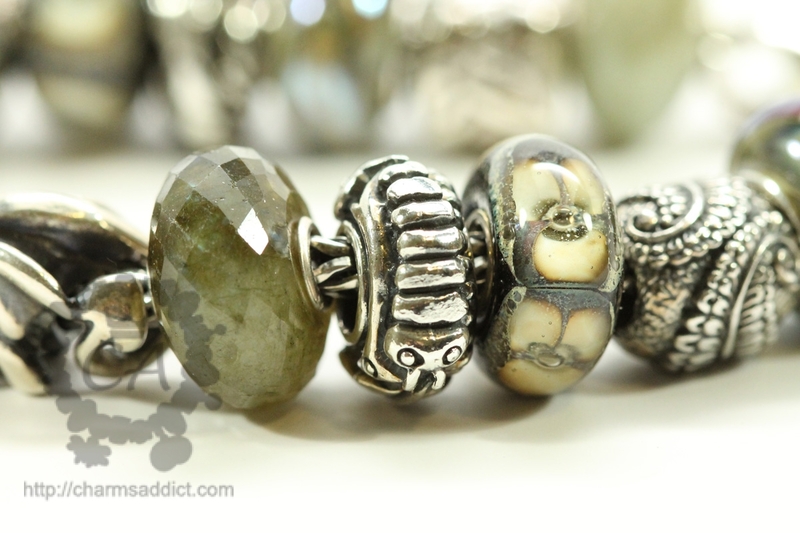 And the silvered beads…and her stone beads…well, I could go on and on about the beauty of her beads. But I imagine that all of your readers will be eager to check them out for themselves if they haven’t already. 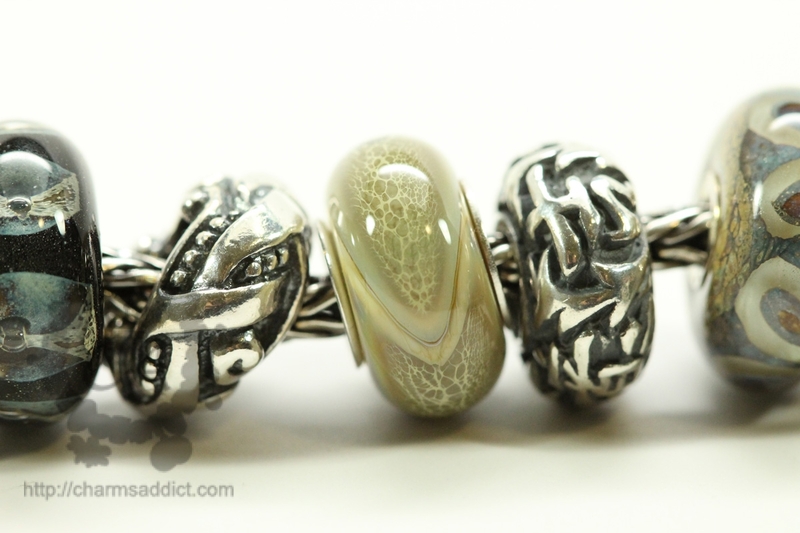 For any collectors out there who have not been fortunate enough to have any of Kathy’s Siberian Tiger beads, we are lucky that Kathy is still producing them today. Thank you so much for such a lovely article on someone who in my opinion is one of the greatest artisans out there! I was so excited Kathy agreed to do the interview, and I’m glad you like it! Her designs are amazing and I will be featuring the Siberian Tigers in an upcoming article ;). I was fortunate enough to meet Kathy when she did a TB event in Los Angeles a few years ago. She was so sweet. She chatted on about how she began making beads and her association with Dale Chihuly and answered every question I had and ones I wasn’t smart enough to ask, all while turning beads in the flame. That sounds really cool! I love glasswork and Chihuly is definitely a huge artist in this area. Yes. I once lived in Vancouver in a building that had a large installation of his glass. I think finding out that Kathy was from the NW and the fact that I LOVE the NW is how we got onto the subject of Chihuly and I was amazed to find that she had worked with him at one point. Thank you for a great interview. It’s truly inspiring to hear how an artist approaches her work. I love the bracelet you put together! Thanks, Jeanne! The pleasure was all mine :). Thank you for such an interesting interview, Leann. 🙂 I have one of Kathy’s tiger beads, and I love it! Thanks for the interview , it is always interesting to meet the designer/ artist of products that I love. 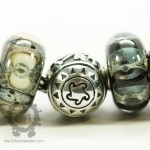 Why were the Tiger bead releases so short lived? Think I had told you that I swore off buying beads in March and here you go tempting me by introducing a lovely new collection of glass especially Dillos. They and floral glass are my downfall.sigh. These are so beautiful. I did check her site but have never ordered online from anyone but Perlen or eBay using Pay Pal to pay. I am not on Facebook or any social sites how do I order from the Etsy stores ? I don’t do PayPal. Kathy is an Etsy merchant who will let you pay by check. Naturally, I wait until she’s satisfied that my check has cleared before I expect her to ship. I think it’s worked for both of us and I deeply appreciate that she’s accommodating in this respect. Loved the article. 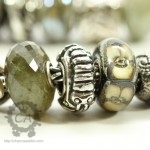 I have loved Kathy’s beads for several years and own lots of them. 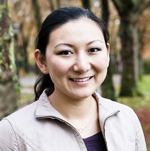 Always so interesting to read about what other things interest her and how she got started. Will always be a fan.